The Fun Shoot will be held November 3, 8 a.m., Butterfield Shooting Range, Corralitos Exit 127 on I-10, towards Deming - 12 miles West of Las Cruces. Prizes will be given! Shoot begins at 9 a.m., but check-in is at 8 a.m. Adult and youth teams are welcome! The cost is $250 per team of five. Lunch will be provided for Shooters ONLY!! Additional lunches can be purchased for $5 each. Proceeds benefit the Doña Ana County 4-H program. Registration: Online registration available. You may pay with a credit card or check. Make checks payable to DAC 4-H and include in the memo line as Fun Shoot. 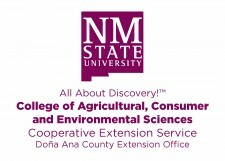 For more information, please contact Eva Madrid at the Doña Ana County Extension at emadrid@nmsu.edu or 575-525-6649. If you are an individual with a disability who is in need of an auxiliary aid or service, please contact, Mary Ellen Dziak by 10/20/18 at 575-525-6649.